The Astrogeographic position of Madrid and past and future Transits, the National Charts for Spain and the resonance of transits of the outer planets in relation to the astrogeographical position of the government area in Madrid. Astrogeographical position of Madrid for morphogenetic field level 1 which defines the supraregional, international role of the Capital of Spain: Madrid is located at 15° of dynamic fire sign Sagittarius traditionally the most important astrological resonator (2nd is Scorpio) for Spanish Culture and 20° of emotional water sign Cancer the sign of emotional independence and feeling at home. While I`m writing this analysis on 24 October 2016 Spain has gone through two general elections since December 2015 leaving the parliament without a clear majority for any coalition of the 4 major parties to form a government. These elections were held on 20 December 2015 and 26 June 2016. From the astrogeographical point of view the factor which makes the situation so problematic is the transit of Saturn over the astrogeographical position of Madrid at 15° Sagittarius. During the 20 December elections Saturn occupied 9° Sagittarius moving straight onto 15° the degree of the astrogeographic position of Madrid on which it became stationary between 12 February and 7 May 2016. During this period the decision for a new government turned out impossible. The 2nd election on 26 June saw Saturn back at 11° Sagittarius. Jupiter was at 16°Virgo a degree of high sensitivity in spanish history (see charts below for the 1978 Constitution, Unification of Castilia & Aragon, Civil War) and in a square and thus intense challenge of the position of any spanish government. The coming transit of Saturn over the 15° Sagittarius position of Madrid between November, 1 and November, 30 2016 can be expected to bring about a decision that could stabilize the status quo but only for a relatively short period of time. Because the main issue of Saturn`s transit – the uncovering and clearing of corruption will certainly not be confronted in November 2016 these problems are likely to come on the table again as soon as Saturn moves into Capricorn in December 2017 and during the phases of Saturn´s transit over the mirrorpoint position of Madrid at 15° Capricorn between January 2019 and November 2019 and the opposition to the 20° Cancer astrogeographic position of Madrid between March 2019 and January 2020. The effects of the global financial crisis reached Spain during the transit of Saturn the planet of stabilization over 15°Virgo the sign of the banking system in exact square to the 15°Sagittarius astrogeographical position of the spanish government between August 2008 and August 2009. Saturn in Virgo stood for the need for careful, conservative, defensive strategical reforms, saving money and all politics related to the stabilization of the banking system. The World Financial Crisis of 2007-12 reaches Spain: Moon-Saturn conjunction square to the astrogeographical position of Madrid calculated for September 27 2008 at 18:29 in Madrid. There were a number of global and national structural problems behind the eonomical situation of the Spanish State that led to the strong effects of the global financial crisis of the years 2007-2012 on the economy of Spain. One is to be seen in political corruption that led to the dependence of the economy from the real estate hype and bubble during the boom years after 1997. The fact that the effects of the crisis reached Spain during the transit of Saturn square to the spanish government stands for its regulatory functions of the crisis for the political management of the spanish economy and banking system. Transist of Saturn are known for the effects of a grounding and stabilizing reality check and an investigation into malfunctions of the politcal and economical organizations. The term “austerity politicies” clearly relates to the topics of Saturn in Virgo. The political system of Spain is going through a highly challenging period between the years 2017 and 2020 with the three major outer planets Uranus, Pluto and Neptune transiting in aspects of intense tension to the astrogeographical coordinates of the spanish government at 15°Sagittarius & 20°Cancer. As I have concluded in my analyses of transits of the outer planets in relation to the astrogeographic positions of Berlin and Washington tight challenging transits provoke and stimulate development through challenging strucutural political and economical problems and the corruption of governments and its unhindered spreading in the country. Periods marked by a lack tight transits of the outer planets as in the cases of the expansion of the Hitler and G.W. Bush regimes often represent phases ín which a lack of such transits is heavily abused by the ruling governments and the lobbyists behind it. This is why tight transits of the outer planets with all the difficulties they bring for the governments should not be occultified as being generally negative as is practised in primitive predictionism. 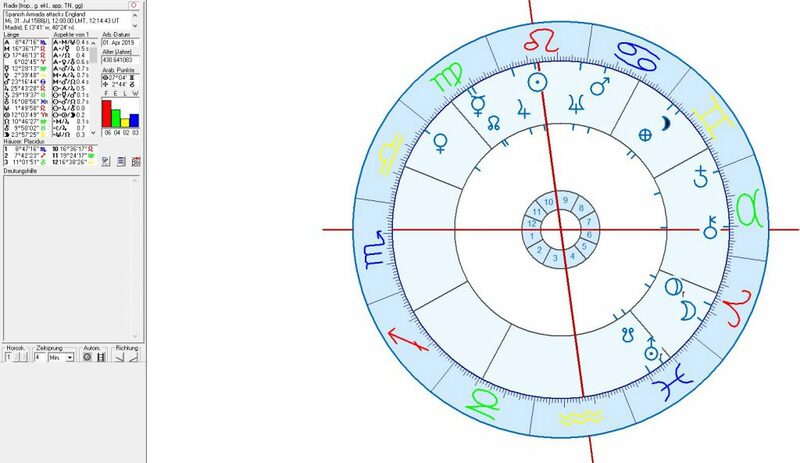 Now – in mundane astrology a serious, progressive and holistic treatment of astrology should include considering all the challenges and processes that are triggered by transits as systemical interior issues of a country´s political system. Uranus` transit over 20° Aries in a square to the 20°Cancer degree of Madrid between May 2015 and March 2017 saw the nationwide installation of the Podemos Party (founded 16 January 2014) as a challenging factor for the political establishment in Madrid. Uranus stands for the need for reconnection with the fuller amount of a system`s ( a nation`s) potential through self-finding, abstraction, challenging the Elites and a strong impact of populism. As in the case of the Brexit Movement during a Uranus square plus opposition to a capital the Podemos Movement makes its gains through its being directed against the business relations of their country with the representatives of the self-administration of the European Nations. It should be analysed in how far this populist coverage of the Uranus transit overwrites the fuller potential of awareness of the population`s and country`s actual potentials. Pluto`s transit over 20° Capricorn and in opposition to the astrogeographic position of the spanish government at 20° Cancer is a process that will take several years. It`s first climax will occur between March 2017 and July 2017 with Pluto stationary on 19° Capricorn. 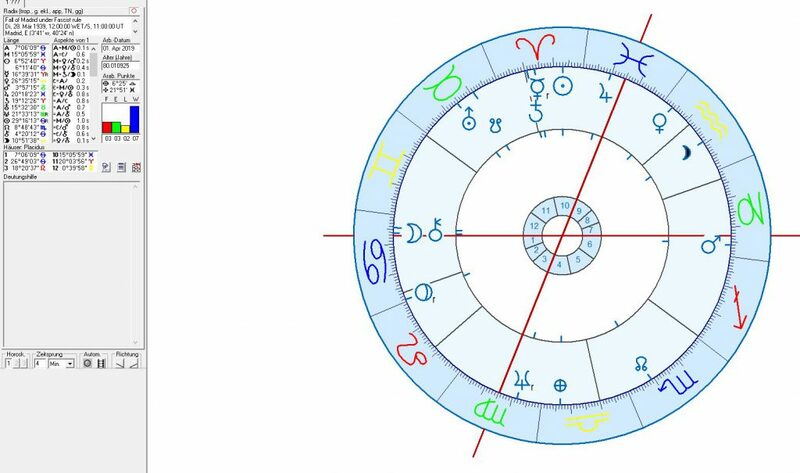 The second phase between January 2018 and August 2018 will see Saturn pass the opposition degree at 20° Capricorn. And the third phase between November 2018 and December 2019 will see the final climax in the process of this challenging period. As the ruler of Scorpio Pluto stands for the capacity of dealing with patterns of experience and perception and the transformation of belief systems and ideology. And Pluto has a highly alert an extremely defensive impact. It stimulates feeling and being attacked. Pluto`s transit through Capricorn the sign of government institutions between November 2008 and 2024 defines an era of transformation of the national goverment institutions in order to lay a foundation for the survival of humanity in a globalized and extremely overpopulated world. The development of the United States of Earth is the clear and unavoidable aim of this development. Therefore the heavily self-defensive impact of Pluto`s transit in Capricorn marks a process in which nations need to take measures to defend and stabilize their autonomy against the actors of globalized capitalism which attempt to destabilize the rights and autonomy of nations for their profits since the beginning of civilizations on this planet. The attack of a US and GB led coalition of global players on the european currency and the spreading of the destabilization begun with the destruction of administration of Iraq in 2003 to Syria, Libyia, Ukraine, Africa, Russia and the EU since 2008 was initial for this era. The term “austerity politics” is a populist interpretation of the financial situation of a number of european countries during this Pluto transit. The era of Neptune`s transit over 15° Pisces the exact square position to the spanish government at 15° Sagittarius will be initialized when Neptune reaches 14° Pisces between May 2017 and July 2017. The phase of the transition over the exact square will be effective between March 2018 and January 2020. The era of Neptune`s transit through his own sign Pisces between March 2011 and January 2026 stands for the reconnection of what we mistify as spirituality with the spiritual plane itself. The habitual perception, lies, dogmas and commercial use of religion to overwrite spirituality can be expected to erode and to some extent be washed by away by the problematic experiences of mankind during this era of corruption, illusionism, occultism and deceit. As the ruler of Pisces the 12th and highest stage of development in the systemical definition of the zodiac Neptune stands for the most subtle (aka spiritual) level of matter that pervades and holds together all the 12 spheres. It is the sphere of Pisces with its basis the emptiness of space or so-called nothingness of the nothing from which all matter emanates. As such Neptune transits invade our perception with information that goes beyond our practised routine of habitual perception and understanding. Neptune brings back our capacity to deal with supressed reality. The ecological catastrophy organized by mankind is a central topic of Neptune simply because humanity neglects the ecological effects of heavy overpopulation on our planet. Neptune`s square transit does not necessarily stand for an economical meltdown or depression as a primitive interpretation of astrology could habitually suggest. As the planet of transcendence, self cleaning and self-healing processes Neptune transit stands for issues in which the conditions for future development include the flexibility to open up to a country`s fuller potentials. That includes self-healing and self-cleaning processes, recapitulation of lies, errors, corruption, propagandistic players, illegal activities, suppressed historical facts, and the country`s strucutural structural problems. In the long run Neptune issues call for the need for autonomy and taking over responsibility to act faster and with a more holistic perspective. A country`s financial situation, its debts. problems with neighbour countries or global players and anyway territorial integrity are typical issues during Neptune`s square and opposition transits. The coming square transit of Neptune to the astrogeographiocal position of Madrid between 2017 and 2020 could actually force the spanish government to further stabilize the fundaments of the spanish economy and fight back the influence of global economical players over the country`s ressources and autonomy. Unlike in the case of the Brexit referendum during a Uranus square to the government in London Neptune´s square to Madrid does not indicate that a spanish exit from the EU can be expected. Neptune`s square transit to the 15°Sagittarius position of Madrid points at a process of self-finding, self-reflection, self-healing. Neptune stands for threats to a countr`s territorial integrity. As Sagittarius represents the sign of travelling and first astrological indicator for tourism the August 2017 anti Tourism demonstrations in Spain are to be understood as an expression of the fears brought about by the Neptune square. In 2016 Spain was ranked World no. 3 country in tourist arrivals. Slogans like “This isn`t tourism its an invasion”, “Your luxury trip . my daily misery”, “Barcelona – tourists welcome – locals not welcome”, “Your selfies are rising our rents” explain the problems and fears that arose through tourism for the local people during Neptune`s square transit. 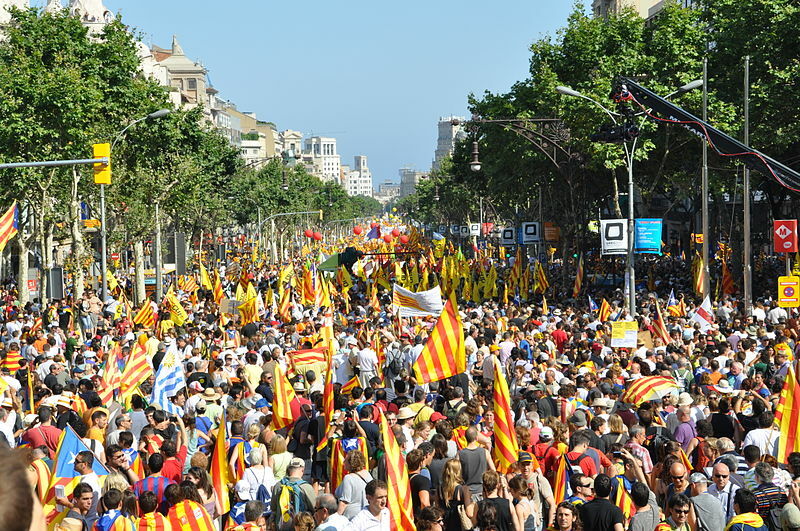 The illegal “Independence Vote” in Catalunya on October, 1 2017 represented a major climax in the process of development stimulated by these transits of Uranus, Pluto and Neptune. Uranus first return transit over his position during the rise of the fascist era in Italy, Germany and Spain has paved the way for populism, nationalism and organized neofascism. This transit stimulated the process that led to the illegal “Independence Vote” in Catalunya of 1 October 2017. Neptune`s square transit to the 15°Sagittarius position of Madrid points at a process of self-finding, self-reflection, self-healing. Neptune is the astrological significator for the spiritual aspects of reality. Its transits are known to challenge superficial judgement, nationalist pride, territorial integrity, stability of existing structures and the control exerted by the central government. The attempt to get to a more abstract overview of matters, understand the point of view of opponents and the readiness to negotiate but also to act quickly and decisevly are methods to deal with Neptune transists. And especially in the case of governments Neptune should be dealt with by investigating into corruption. Pluto`s transit in opposition to the central government Madrid stands for the need to reform and transform the political system. The reforms of the constitution that have been proposed by the PSOE as an answer to the Catalunyan situation in October 2017 may seem appropriate during this transit. But at the same time it is no secrete that during an opposition from Pluto a major focus has to lie on the self-defense of the political system against pressure and attacks from opponents. The challenge from dogmatic and neofascist lobbyism and propaganda during such a transit of Pluto may seem all too forseeable. But nevertheless such challenges have be dealt with in a serious way by meeting with the problematic issues brought up at such times. The transition phase from the fascist Regime to the new democratic Spain was begun on 20 November 1975. It ended withon December 29 1978 when the new constitution became effective. The foundation of the modern democratic Spain as a constitutional monarchy was carried out on 22 November 1975 only two days after the death of fascist dictator Francisco Franco. The most important astrogeographical transit at that moment in time was Neptune at 11° Sagittarius approaching the astrogeographical position of Madrid at 15° Sagittarius. This transit put an end to the Franco regime. The comparison to Neptune`s transit over Berlin during the destruction of Berlin and the death of Hitler between 1944 and 1945 represents a remarkable parallel to that Neptune transit over Madrid. And even more so because it was the german fascist regime that helped decide the spanish civil war in favour of Franco. The parallel of the relaxing, stilling and healing influences of Neptune against fascist regimes is remarkable in these cases. Compare: Astrogeographical position of Berlin and Future Transits. 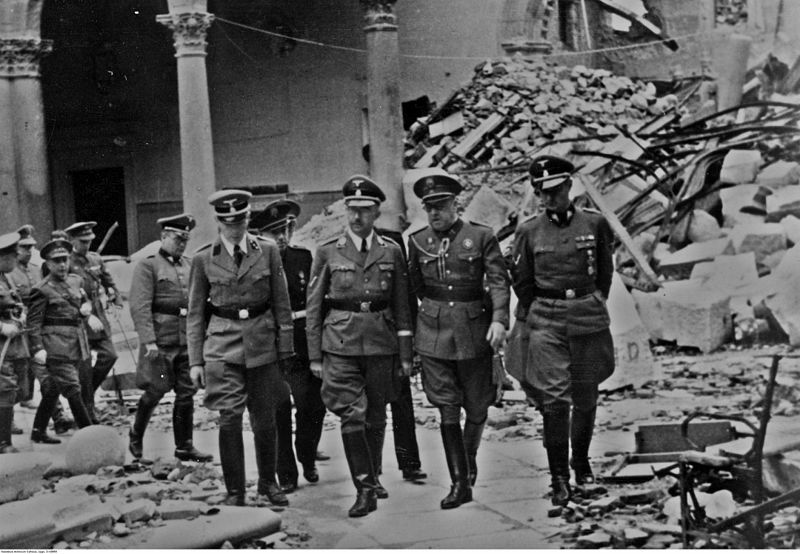 A difference between the cases of the fall of the regimes in Berlin and In Madrid was that in Madrid the change of systems came 2 years before the Neptune conjunction whereas in the case of the Fall of the Nazis this change came only 2 year after the Neptune conjunction for a by then heavily destroyed Berlin. The foundation chart for Modern Spain is calculated for the coronation of King Juan Carlos as the decisive moment for the foundation of the Constitutional Monarchy. The retrogracy of Mars at 1° Cancer one of the signs of Madrid indicates that the development of 20-22 November brought about long time due changes for the spanish people. Mars` role was decisive here for two more reasons: 1st his exact trine with Uranus the planet of revolution and ruler of the ascendant at 4° Scorpio and 2nd is Mars sign rulership over the position of Jupiter at 15° of fire sign Aries an important resonator for Spain`s role in relation to the whole of Europe. Jupiter occupied the exact trine to the 15° Sagittarius position of Madrid ideallistically supporting Spain in taking it`s natural independent and self-defensive position in the morphogenetical field of Europe. 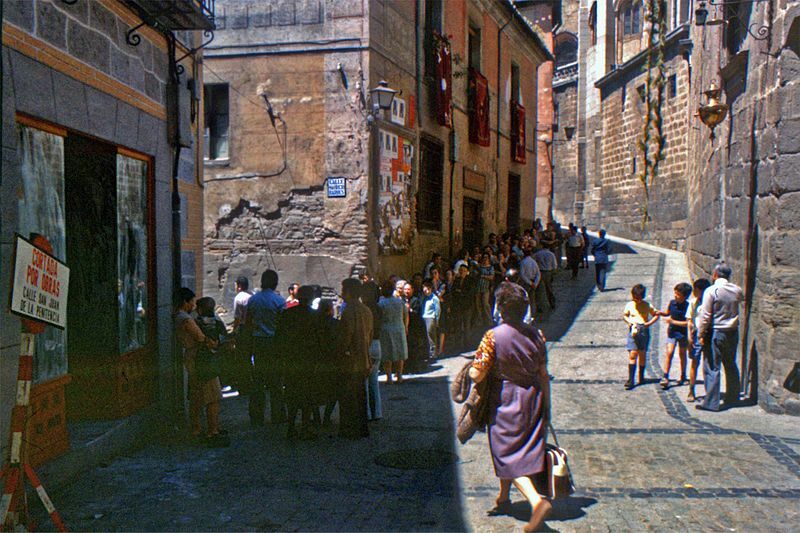 The Spanish general election of 1977 – the first free election since February 1936 was held with Neptune at 14°Sagittarius and exactly conjunct Madrid. In this case Neptune did not have the self-destructive, negative impact that it had for example for Germany and Japan during WW2. Saturn the planetary factor of stabilization was in exact harmonious trine to Madird and neptune there from 15° Leo the sign of royalty and an indicatioon for the stabilizing effects of the royal family and King Juan Carlos for spanish unity and democracy. Three years later on 29 Dec 1978 the new spanish constitution became effective. Saturn the ruler of the stabilization of governments at 14° in self-protective earth sign Virgo in exact square to the 15° Sagittarius emblematic national destiny position of Madrid reveals the efforts made by the new constitution to control the fascist inheritance and old and new corruption within the spanish state, police and government institutions. The same accounts for the position of Mars at 12° Capricorn in a harmonious mirrorpoint conjunction with Neptune (19° SAG) and Mercury (15°SAG) over Madrid. Saturn`s position at 15°Virgo represents a direct resonance on the timeline of history with his position on the date of the unification of Castlia and Aragon in 1479. 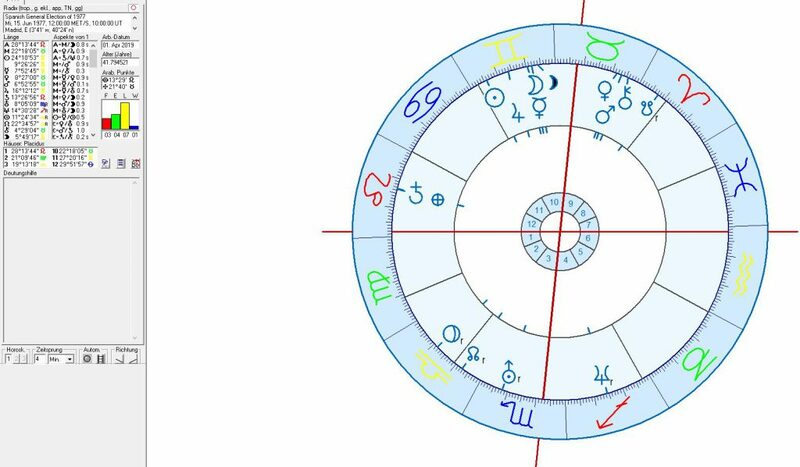 Another relevant horoscope for Spain is the historical chart calculated for the unification of the two kingdoms of Castilia and Aragon which became effective after the death of Juan II of Aragon on 19 January 1479 at 7:00 a.m. in Madrid. The unification of Spain came at a moment in time when an opposition between Mars at 16°Pisces and Saturn on 17°Virgo challenged the 15° Sagittarius position of Madrid through tight squares. The attempt to overthrow the government in Madrid on 18 July 1936 was the beginning of the Spanish Civil War. A day before on 17 July a Coup D` Ètat had been started in spanish occupied Marocco. 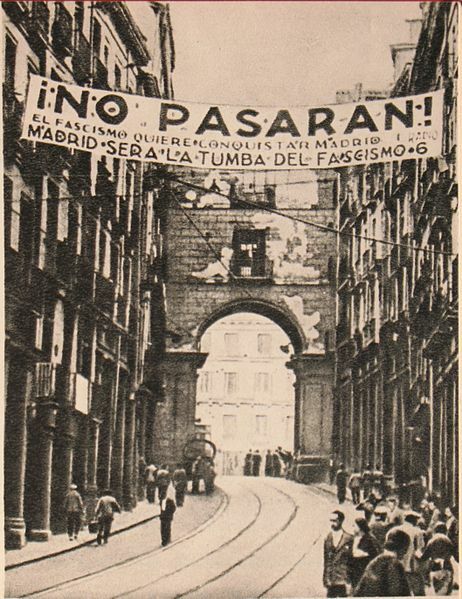 No Pasaran – Madrid shall be the grave of fascism. The resonance of the planetary transits on the day of the Coup D` Ètat with the astrogeographical position for Madrid was extreme. 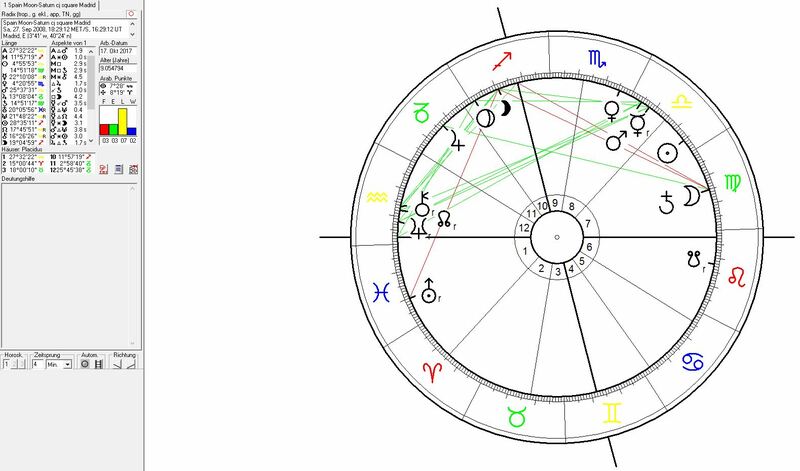 A look on the chart reveals that except Uranus the actual planet of revolution and solutions of interior social and political problems all other systemically important astrological planets were in exact resonance with the positions of Madrid. This also reveals that the “nationalist” attack on the autonomous spanish state was simply not aimed at solving such issues. The start of the attempted Coup D` Ètat on the spanish mainland on 18 July at 5:00 a.m. was carried out with a Moon-Mercury conjunction at 19°-20° Cancer exactly on the 20°Cancer astrogeographical position of Madrid. And the intensity of this conjunction was made even stronger by the fact that the half sum of the conjunction of Sun (25°) and Pluto (27°) with the position of Mars at 15° Cancer fell exactly on Madrid. Jupiter at 15° Sagittarius was exactly conjunct the 2nd coordinate of Madrid indicating the desire for the possession of the capital. Neptune was on 15° Virgo in exact square to Madrid on another really important degree for Spain which I mentioned in the unification chart of Castilla & Aragon as well as in the chart for the modern spanish constitution of 1978. 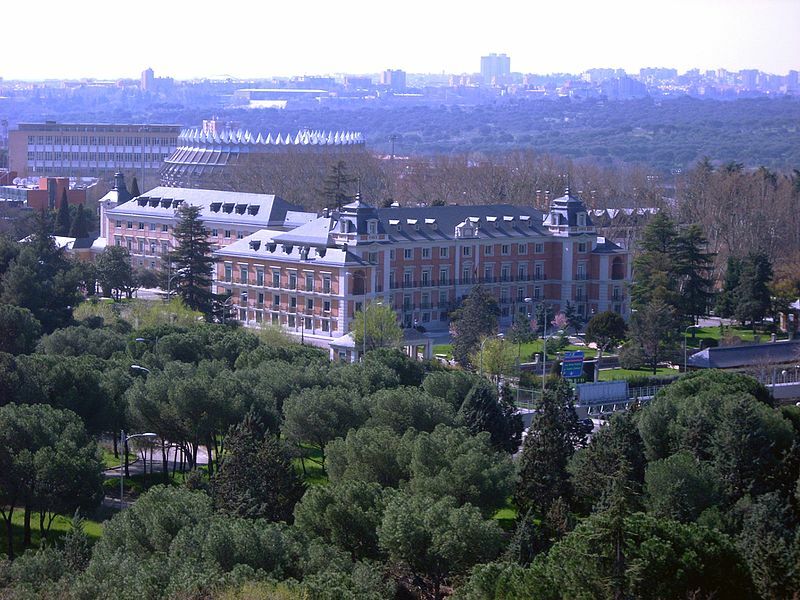 It is remarkable here that the period between Neptune`s transit over the square position to Madrid in July 1936 until his transition in conjunction to the capital between 1975 and 1978 represented the beginning and end of the fascist era in Spain. The Siege of Madrid by Franco and his allies (Italy, Germany) began in October 1936 and ended on 28 April 1939. The day of the Fall of Madrid into the hands of the spansh fascists under Franco came with Saturn at 19° in Aries the sign of german culture and in a tight square aspect to the 20°Cancer coordinate of the spanish capital Madrid. Jupiter near midheaven in a constellation of victory was at 20°Pisces in an exact harmonious trine to the capital (20°Cancer position) indicating that the actual battle for Madrid was simply over. Saturn was joined by Mercury on the important spanish national resonance degree at 15° Aries and in exact trine to Madrid (15°Sagittarius position) too. 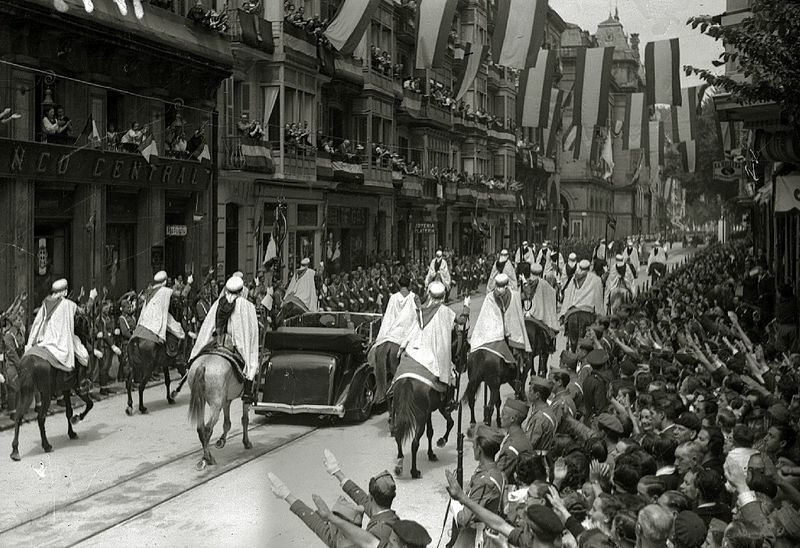 Once that the Battle for Madrid was over these transits must have made it a relatively and supportive moment for installing a new stable government. The Spanish attempt to conquer England in the summer of 1588 was made during a Uranus transit over 15°in mystical, water sign Pisces in exact square to the 15°Sagittarius astrogeographical coordinate of Madrid. This aspect seems to describe the enexpected and bitter defeat of the Spanish Armada. This position of Uranus as the planet of globalization, self-finding and leavin ones own roots behind describes the spanish attack as an attempt motivated by the hype of fast globalization than by a solid strategy of economical and technological growth. Astrological chart for the battle between the Spanish Armada and english ships calculated for 31 July 1588 (julian date9 and for 12.00 noon. The unexpected technology of the small english ships and their superior long range cannons can be understood as the factor represented by the Uranus square position to Madrid during the battle. As the ruling planet of Aquarius the sign of the bigger and strongest winds Uranus could be understood to have played an important role in damaging parts of the spanish fleet on its escape around the north coast of Scotland. 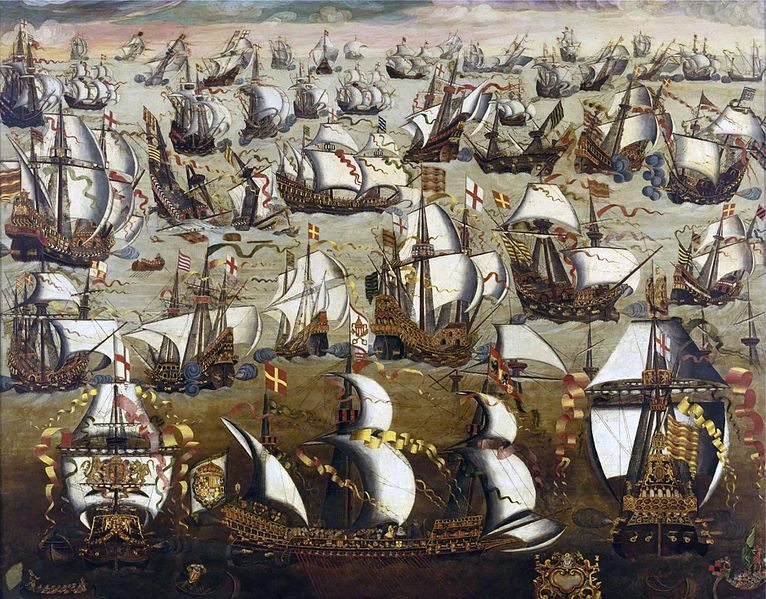 It is remarkable that the attack of the Spanish Armada was carried out without any serious planetary threat to the astrogeographical position of London but with a serious planetary threat to Madrid.